Just in time for the holidays, here’s another “Madonna and Child” painting by Carlos Crivelli, the enigmatic Quattrocento master. Ferrebeekeeper has already featured two posts about Crivelli including a short biography (which includes just about everything we know about him) and an exquisite painting of Mary Magdalene. Today we present another Crivelli tempera masterpiece from 1460 which shows Mary holding a pensive baby Jesus as creepy little foreshadowing figures gather round. Although Mary is not without a certain supercilious beauty, the two central figures are not nearly as fine as in other Crivelli masterpieces. Standing on his little black velvet pillow like a demagogue orator, Jesus looks downright horrifying (and he also seems suitably appalled at knowing his own fate). The great strength of the painting lies in the supporting cast of corpulent androgynous children brandishing accoutrements of the crucifixion. 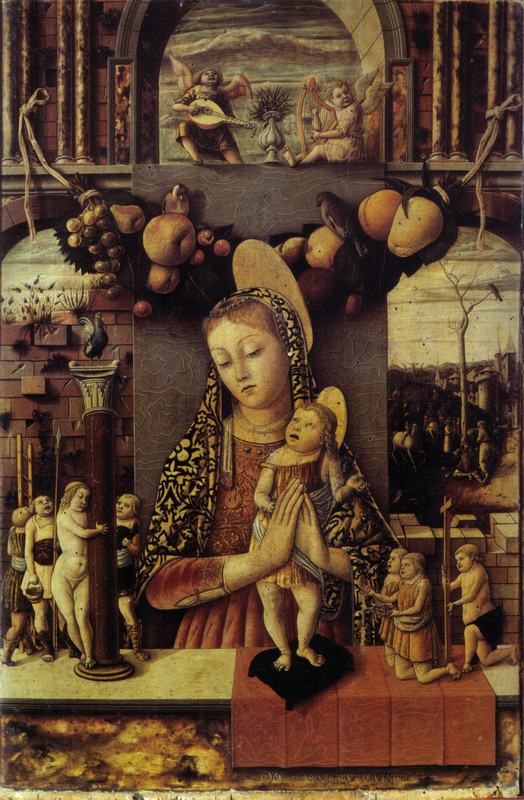 The little beings to the right solemnly proffer a crown of thorns and a cross to infant Jesus. On the left, one child (wearing tiger skin grieves!) holds a fistful of crucifixion nails while his naked playmate grasps a classical column with spidery hands. Behind him are children with a lance, a bucket of vinegar, and a ladder. The little lanceman on the left is staring up at an allegorical rooster standing atop capitol. In the background, on the right, the death of Christ takes place on a distant hill, while at the top, beyond a garland of peaches, pears, cherries, and songbirds, a final pair of putti play divine music on the harp and lute. The suffusion of tiny black pits or holes in the composition was probably not intended by Crivelli (although he did have a fascination with nail wounds), but it adds an extra dimension of entropy, torment, and decay to an already vexing painting. Once again Crivelli deftly takes traditional religious elements of the passion and arranges them into an allegory which seems to subtly elude the comprehension of the viewer. Is that Peter’s rooster or is it some lost symbol of 15th century Italy? Are the childish beings with the implements of Christ’s death a vision of the anguished Christ child, or are they meant to represent us, the viewer, tormentors and torturers of the world who, like ignorant children, don’t even understand what we are doing? 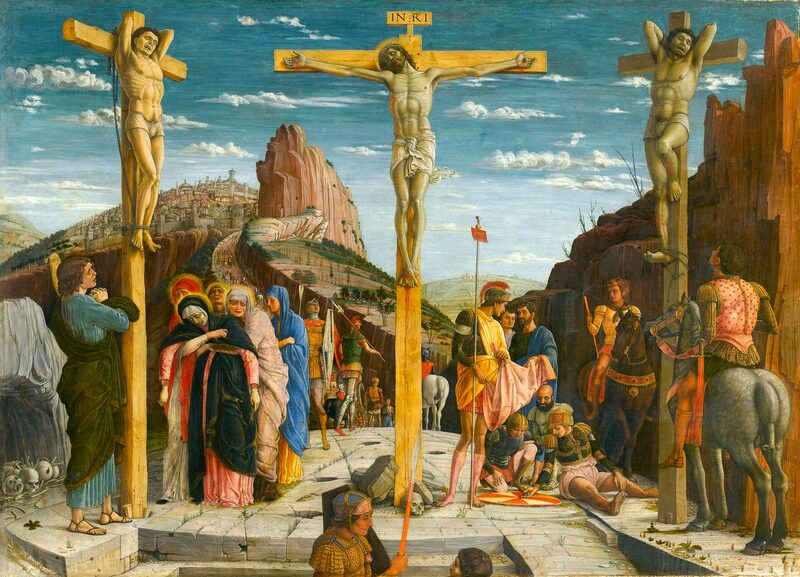 Probably the most common theme of Gothic painting was the crucifixion of Christ, an event which was central to the universe-view of nearly all Europeans of the late Middle Ages and early Renaissance. 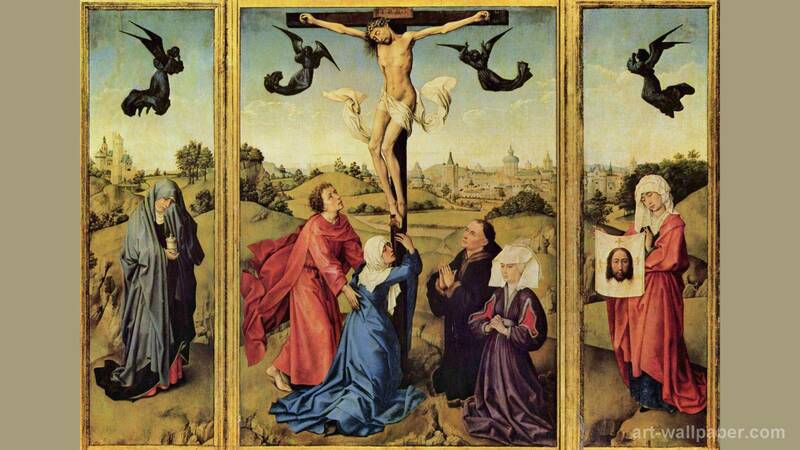 To observe Good Friday, here is a triptych of the Crucifixion painted by one of my favorite Flemish painters, Rogier Van der Weyden (1399 or 1400 – 1464). The painting was probably completed around 1445 and can today be found in the Kunsthistorisches Museum in Vienna. Very little is known concerning Van der Weyden’s life and training. We know that he was an international success and rose to the position (created expressly for him) of official painter of Brussels–then the location of the renowned court of the Dukes of Burgundy. But aside from that, only tidbits are known about a man who was probably the most influential and gifted Northern European painter of the 15th century. Van der Weyden painted from models, and this crucifixion demonstrates a very compelling realism. The grief and incredulity of the mourners is conveyed in their vivid expressions and poses. The magnificent color and beauty of their garb underlines the importance of the spectacle. Behind the figures is a huge empty landscape which runs continuously through all three panels. The left wing shows a medieval castle, but the other two panels present a strange idealized Jerusalem. The greatest glory of the painting is its nuanced palette. The magnificent vermilion and ultramarine robes leap out of the muted green landscapes. 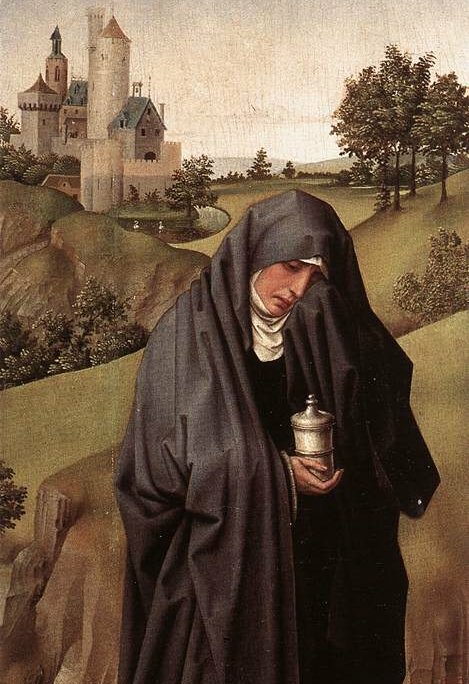 Van der Weyden was renowned for using many different colors. Art historians have averred that even the white tones in his greatest compositions are all subtly different. Color also lends an otherworldly numinous quality to the dark angels hovering unseen on indigo wings as the execution takes place.